David is one of the founding members of Anthony & Zomoida, LLC. The firm was developed in July, 2006. 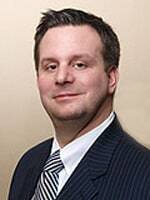 He concentrates his practice in the areas of Family, Criminal, Personal Injury, Telecommunications, Zoning, Real Estate Foreclosure and Business Law. Prior to becoming a partner in Anthony & Zomoida, LLC, David was a partner in Sindyla, Anthony & Sindyla from 2001 - 2006. A native of the Youngstown, Ohio area and a graduate of Ursuline High School , David presently resides with his wife Kcey and his sons Bernardino and Gianni in Broadview Heights, Ohio. He is active in several professional organizations including the Ohio State Bar Association, Parma Bar Association and the Southwest Bar Association.